The Detroit Red Wings kicked off their season on Thursday night at the brand new Little Caesars Arena. NHL commissioner Gary Bettman was in attendance for the milestone first game (quotes on my Twitter, link at the bottom). As RFA Andreas Athanasiou continues to sit out, forward Martin Frk, drafted in the second round of the 2012 draft (same draft class as Athanasiou) has taken full advantage of this situation. The hole that AA left in the lineup was easily filled by someone with a different set of skills. Skills that will make opposing goalies fear. He has what teammate Anthony Mantha declared “probably the hardest shot in the league.” That may be a bit of biased hyperbole, but it’s not that far from the truth. His lethal slap shot and one-timer that allowed him to dominate the American League has now led him to the NHL. European players might (and often do) tend to give up on their dreams of playing in North America if it takes upwards of five years. I asked him if the dream was always to play in the NHL. After last season’s roller coaster, which saw him waived by Detroit, claimed by Carolina, waived by Carolina, re-claimed by Detroit, and then sent down once again to Grand Rapids, he considered giving up the dream and playing in Russia’s KHL. 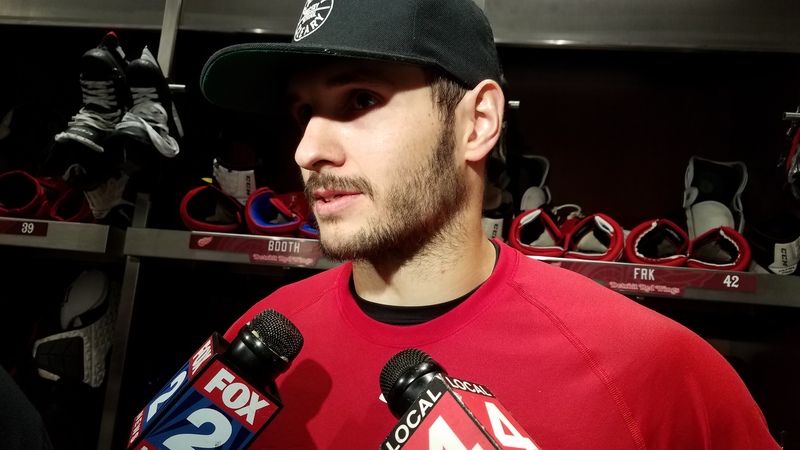 However, after winning the AHL’s Calder Cup with the Griffins (he scored 15 points in 16 games) and a little convincing, he decided to re-sign with the Red Wings, and that decision is already paying dividends. After a strong training camp, he has secured (for now at least) a spot in the team’s top-six, on a line featuring center Dylan Larkin and winger Anthony Mantha. The line was dominant throughout the pre-season, and that translated into Thursday’s season-opener. I can attest to the fact that Frk is one of the most determined and hard-working players, and he’s a testament that hard work and patience will pay off in the long run. He’s a modest, humble man, and he’s poised to have a memorable year if all goes according to plan. Mantha scored the first goal of the game on the power play, following a Frk blast from the point. Mantha scooped up the rebound and scored on goalie Devan Dubnyk. 23 seconds later, Larkin scored on the power play, redirecting a Mike Green blast. Mantha assisted, and Frk was still on the ice. Not often do you see the same power play unit strike twice in such short time. Frk finally got his chance to shine, as he scored the game’s final goal with a hard slapper, securing the 4-2 victory. It was his first career goal, his first career assist, and it all came on his 24th birthday in the opening of the league’s newest arena. That has to be one of the best birthday’s a young player could ask for. He considered his shot to be a “lucky goal,” indicative of his humble personality, although there was very little luck at play.